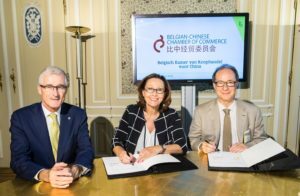 It’s official: The Belgian-Chinese Chamber of Commerce (BCECC) has reached a structural collaboration agreement with Flanders Investment & Trade (FIT), Flanders’ agency for international enterprise. The agreement was signed on 3 October 2017 by Bernard Dewit, Chairman of BCECC, and Claire Tillekaerts, CEO at FIT, during an official ceremony at the Hotel Errera in Brussels. Flanders’ Minister-President Geert Bourgeois also attended the ceremony, formally sealing the reinforced collaboration. This partnership is embedded within ‘Vlaanderen versnelt!’ (‘Flanders accelerates!’), Flanders’ internationalization strategy. BCECC and FIT will work closely together to support the internationalization plans of Flanders-based businesses even better and in a more streamlined way. This will be done, among other things, through seminars, conferences and trade missions. These structural partnerships are valid for the period of 2017-2021. Their scopes go beyond earlier project-based collaborations, while the funding is split 50/50 between the partners and FIT. 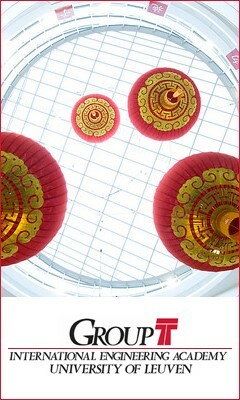 Every year, the partnerships will be evaluated based on pre-defined key performance indicators (KPIs). That way, their impacts can be measured objectively.